BNX-AS system, Etherium Reach region. 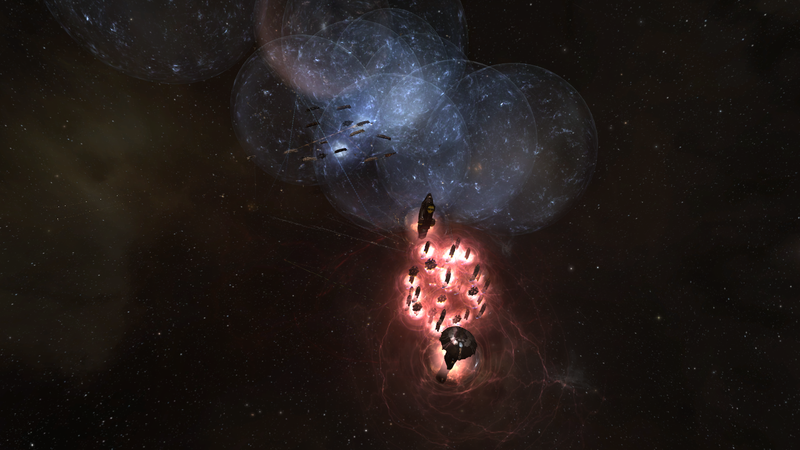 On the 26th of May, 19:00 EVE Standard time, the system erupted into violence as the Vanguard Coalition and Nulli Secunda [S2N] clashed, leading to no less than 5 Super Carrier loses on [S2N]’s part and involving 4 coalitions in the fighting. The battle started after the Vanguard Coalition reinforced a few structures in the region and was heading back to their staging. Their fleet was a mixture of Typhoon and Rattlensake Battleships, with Capital support, all told around 110 pilots strong. The force was making its way through the BNX-AS system. [S2N] learned of the force’s existence and formed their own Rattlesnake Battleship fleet with 70 pilots and their own Triage Carrier support as well as a few Dreadnoughts. As the Vanguard Coalition force was on the 9F-3CR gate, [S2N] bridged on top of them with their fleet, and the Vanguard Coalition commanders decided to take the fight. Both sides engaged each other, with the battle turning into a brutal back and forth between the two, as sub capitals and Capitals were decimated on both sides. 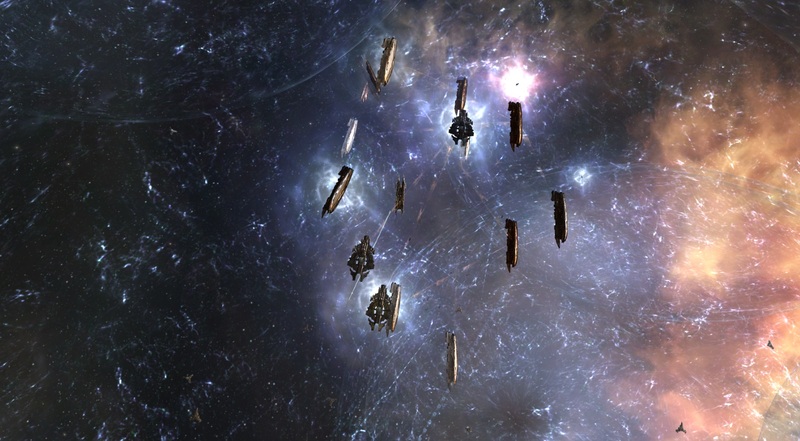 The Vanguard Coalition managed to reinforce their Capital wing and finally dispatch all the Triage support for [S2N], dooming its sub capital fleet. Thus, [S2N] decided to further escalate, bringing in their Super Capital fleet, at least 14 Super Carriers, who made short work of the Vanguard Coalition fleet. The Vanguard Coalition quickly retreated, as it was losing Capitals and Battleships, but started bubbling the Super Carriers on the gate, re-shipping to Interdictors and bringing more and more into the system. Contact was established with Pandemic Legion [-10.0] who had information on the [S2N] Super Capital movements and had formed a 100 pilot strong Proteus Strategic Assault Cruiser fleet. That fleet quickly burned to the system, however at the same time, [S2N] managed to clear the bubbles on the gate and warp its Super Capital fleet to a safe in the system. It seemed as if the Super Carrier fleet would jump out to safety before [-10.0] could reach the system. At that point disaster struck, as the ship which was suppose to light the Cynosural beacon did not have enough fuel, stranding the [S2N] Super Capital fleet in the system. Vanguard Coalition forces used the extra time and managed to probe the ships down and quickly bubble them again, with [-10.0] Interdictors reinforcing them, the sub capital fleet only a few jumps behind. Finally the [-10.0] force reached the system and warped on top of the tackled Super Carriers, they quickly began killing support ships whilst their own Super Capital fleet burnt all the way to the battle. As the first [-10.0] reinforcements landed on grid, the [S2N] Super Carriers managed to clear enough bubbles to jump out to the marginal safety of the LXQ2-T system, leaving behind 3 Aeon Super Carriers to be tackled by [-10.0]. The Aeons tanked a while as more [-10.0] Super Capitals made it into the system, the [-10.0] sub capital fleet was busying itself with clearing whatever sub capitals [S2N] had remaining on the field before all focused their firepower on the Super Carriers. 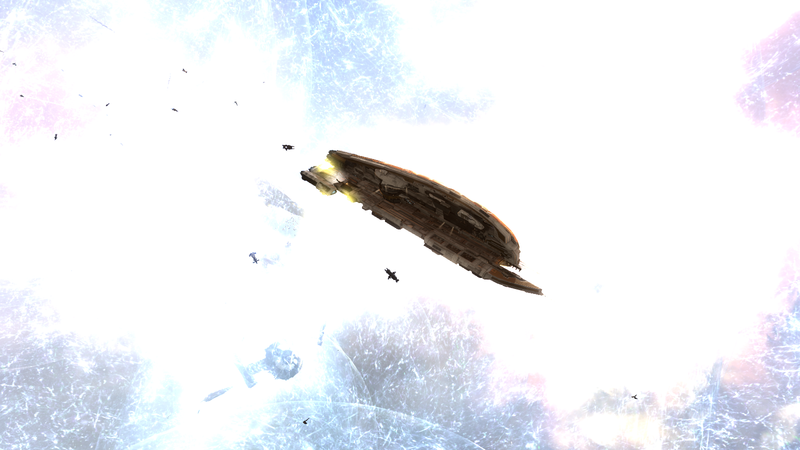 One by one the Aeons succumbed to the relentless punishment thrown at them by the [-10.0] and allied fleets. Finally, with the last Aeon destroyed, the [-10.0] sub capital force bridged to LXQ2-T in order to continue the battle. As it turns out, though [S2N] managed to jump 11 of its Super Carriers to LXQ2-T near their staging tower, [-10.0] had Interdictors already in the system. They quickly warped to the Cynosural beacon and bubbled the Super Carriers, who probably thought the nightmare was over, while waiting for reinforcements. 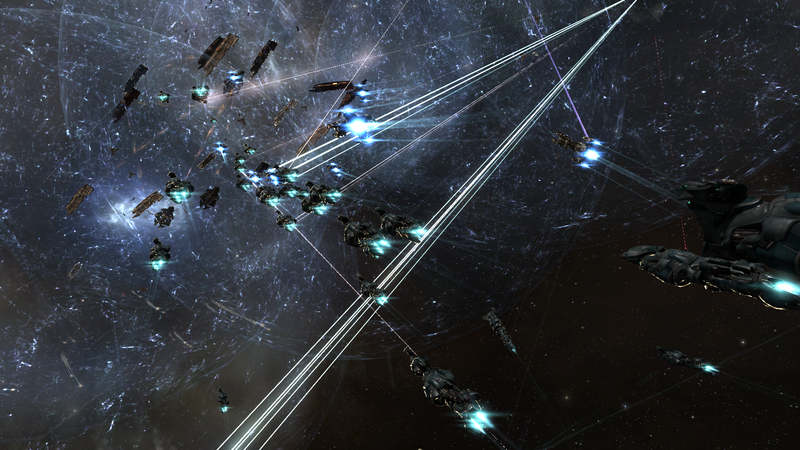 Most of the Super Carriers managed to slowly burn their way into the safety of the tower’s shield, except 2 Aeons. The 2 Aeons were bumped away thanks to the help given by StainWagon Coalition who arrived in the system after hearing of [S2N]’s situation and hoping to capitalize on it. [-10.0] contacted the StainWagon fleet and they agreed to help the Interdictors in bumping the two Aeons away from the tower and keep them bubbled, as the [-10.0] sub capital fleet bridged into the system in hot pursuit. It warped on top of the two Aeons and lit a cynosural beacon for their Super Capital fleet to jump in. Into the system poured the [-10.0] Super Capitals who were ready to engage the remnants of the [S2N] force. Besides the two Aeons, 2 Archon Carriers were also caught, 1 with the main Super Carrier force, and another was dragged by the bubbles away from the tower and destroyed by one of the Titans who promptly used its Doomsday weapon on it, just as it was nearing the shields. With no more support present on grid, it was time for the Aeons to die and one after the other they dropped, increasing [S2N] Super Carrier losses to 5. With the rest of the Super Carriers safe, [-10.0] forces safely extracted both their fleets, returning to their staging system. Battle report for the BNX-AS and LXQ2-T systems can be found here. The fighting saw 400 pilots in the BNX-AS local, and nearly 560 pilots in the LXQ2-T system by the end of the engagement. Time Dilation was a constant factor, reaching upwards of 20% and felt up to 7 systems away from the center of fighting. The battle on its two parts lasted for 90 minutes. All told, at the time of writing, [S2N] lost no less than 5 Aeon Super Carriers, 6 Carriers, 5 Dreadnoughts and 26 Battleships. Including their support ships, [S2N] lost no less than a 105 ships for a total of 203 Bil ISK of damages! The Vanguard Coalition lost 9 Dreadnoughts and 4 Carriers, as well as 23 Battleships. Their total losses add to 114 ships, including many Interdictors, for a total of 52 Bil ISK of damages. [-10.0] lost 16 ships, the majority of which were Interdictors, for a negligible 2.6 Bil ISK of damages. [S2N] admitted that a lot of mistakes were made in the battle, leading to those Super Carrier losses. The Vangaurd Coalition for its part did not plan on involving [-10.0], and the initial fight in BNX-AS was unplanned, the result of them getting caught during travel. [-10.0] have kept an eye on the Drone Lands since the conflicts first flared, intervening on both sides, this time on Vanguard Coalition’s behalf considering the targets. 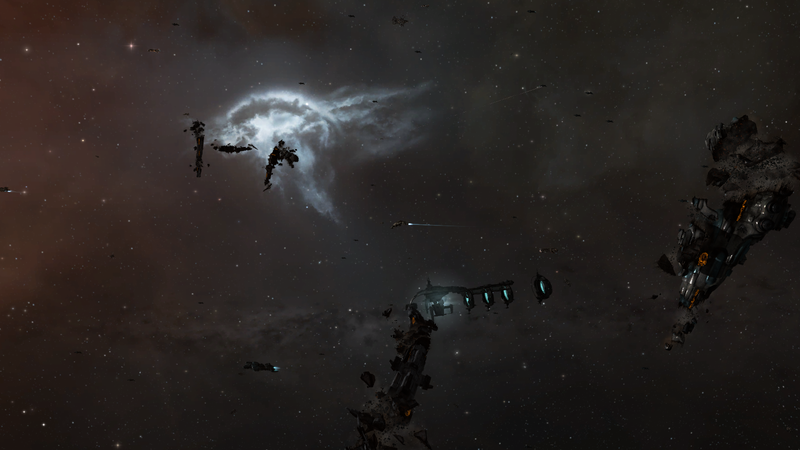 As the bloody conflict in the Drone Lands continues to take its toll on both sides, it seems certain that these will not be the last Super Carriers to die, as both sides clash ever more violently over control of the North East of New Eden. Special thanks to the following: Garst Tyrell of No.Mercy, Triumvirate. [TRI], progodlegend of Infinite Point, Nulli Secunda [S2N], creatnos and Wrik Hoover, of Hoover Inc. Pandemic Legion [-10.0] for granting interviews. Special mention for Paul Trier, of Hoover Inc. Pandemic Legion [-10.0], who supplied the screenshots and fin1712, of Hoover Inc. Pandemic Legion [-10.0] for supplying the video footage. Salivan Harddin writes for The EVE Scribe, Providence Bloc’s News Portal. When he isn’t busy writing articles, he usually drifts off the anchor in fleet. I have been checking out a few of your posts and i must say pretty clever stuff. I will surely bookmark your website. Normally I don’t learn article on blogs, however I would like to say that this write-up very forced me to try and do it! Your writing taste has been surprised me. Thank you, quite nice article. I do believe all the ideas you have introduced in your post. They’re really convincing and can definitely work. Nonetheless, the posts are very short for novices. May you please extend them a bit from next time? Thank you for the post. I¡¦m now not sure where you are getting your info, but good topic. I needs to spend some time studying much more or understanding more. Thanks for magnificent info I used to be searching for this information for my mission. of course like your web-site however you need to take a look at the spelling on several of your posts. A number of them are rife with spelling problems and I to find it very bothersome to inform the truth on the other hand I will certainly come again again. Thanks for any other informative website. The place else may just I get that kind of information written in such a perfect means? I have a project that I am simply now working on, and I have been at the look out for such information. I just want to tell you that I am beginner to blogging and actually loved you’re blog. Almost certainly I’m going to bookmark your blog post . You actually come with perfect articles. Thank you for sharing with us your web-site. What are some truly good verse blog sites or sites to post journal entrances? Do you have a blog? I have a verse blog. =-RRB- If so, what’s your web link so I can inspect it out as well as follow you. =-RRB-. I already have one started. =-RRB-. Where online can an accredited psyciatrist post articles (or blog sites) for them to end up being preferred?